Where did January run to? It feels as if December was just a few days ago. I guess the days are flying by because of the upcoming elections here in Nigeria. Today is the first day of February, recognized as the love month worldwide. As the coming days roll in, expect to see a lot of vivid red colour, on cars, in buildings, and even on people. There will also be a lot of romance in the air, with many babies getting conceived this month. And definitely, expect the invitations to begin landing in your mail, especially if you are single. 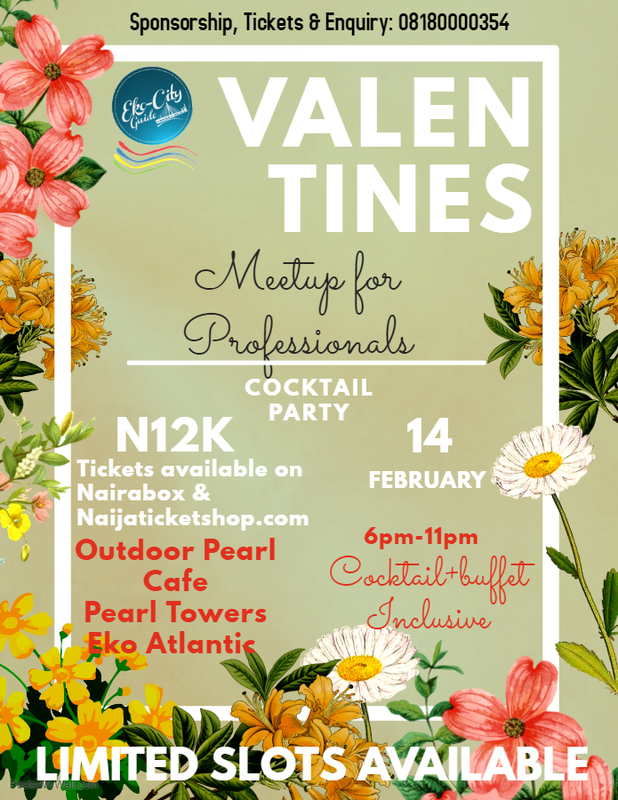 One such events is the Valentines Meetups for Professionals which will hold at Eko Atlantic, on February 14. It promises to provide a relaxed romantic atmosphere where cupid may just lead you to what you have been searching for. Bonus: People who pay through the website get a taxify code for N1100 off 3 rides. So are you in Lagos? Are you a working professional? What are you waiting for? Yeah. This is the only year January ran fast 😁 I just stumbled on your blog and I think I’ll be spending more time here. I blog at https://oldnaija.com where I discuss Nigerian history and culture. You might want to check it out. Thanks. Thanks for stopping by Tes! I’m heading over to yours now – I love Nigerian history and culture, and believe it should be kept alive for the future to enjoy. Exactly! For the future. Thank you for visiting, Daydah.